previous: Fenton - the centre of the universe? Longton is like a tureen of soup. By that I mean it’s a big mix of essential ingredients added over a long time to make a concoction of wholesomeness. But as the years have passed the ingredients have lost their nutrition and the once rich content has become thinner and weaker. What once started out as a rich stew is now as insipid as a poor man’s broth – its character has become diluted and its constituent blend is meagre. Longton in the 21st century is not much more than an aftertaste of a supreme banquet, a flavourless end-course to a memorable dinner. I visited Longton on a rainy Thursday and walked around the cyclical traffic system of Market Street, Commerce Street and the Strand. Despite it being early closing there were plenty of shoppers scurrying about. In the Bennett Precinct I called at the café; it’s called ‘A Plaice To Eat,’ a self-service arrangement with passé décor, an obvious meeting place and respite hub for the bustle of townies a third of whom were chirruping on mobile phones across the airspace of Stoke-of-Trent as they sipped tea from John Tams’s plain blue café-mugs. Here I meet Ken Hackney an ex-pat from Cheshire who chose to live in Longton some ten years back. As a relative stranger what did he think about Longton as a community centre? “I came here for convenience.” He says. “It’s okay but of course it can’t compare with South Cheshire. Different people you see. People here are working-class living in a town resistant to change. And the town’s pretty run down, don’t you think?” – I do. As we walk along the Strand Ken admiringly points out the great Victorian architecture and comments on the places that have closed or changed use, and I lose count. 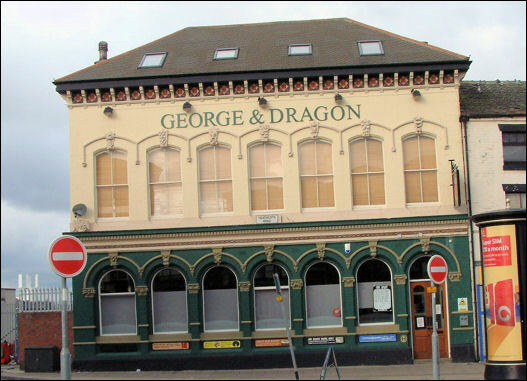 The George and Dragon, once known affectionately as ‘the Old Hut,’ and the Waterloo Inn, both of which still have the benefit of outstanding architectural design, stand empty and forlorn. This is true and I query why a lick of paint shouldn’t also be applied to the shops and offices which have all fallen to the same decline. It seems that nobody is at all interested as they, in their cars, are swiftly decanted through the complicated traffic-controlled crossroads where the Crown Hotel stands face-on to the stately town hall across the ocean-like Victorian width of road. Mind you, traffic is less congested these days since the new A50 has taken precedence in its charge eastwards. Town vehicles turn clockwise like some wacky merry-go-round in a dilapidated pleasure-land rolling to the jingle of a run-down hurdy-gurdy. 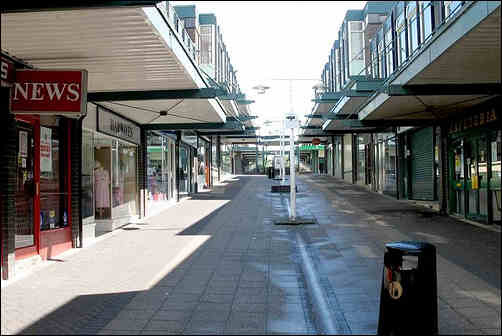 There seems to be more people in cars than on the pavements as they dizzyingly swing past the countless charity shops. But then again most pedestrians are hidden and confined within that most dispassionate of place-names – the Longton Precinct. Approaching Normacot Road I encounter Short Street and Chelson Street at the rear of Gladstone Pottery Museum. 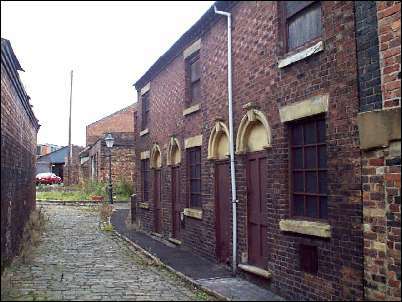 This was once an important heart of Longton’s community with terraced cottages lining narrow cobblestone lanes some of which have been preserved among a cluster of heritage-listed bottle-ovens. Even though this location is dedicated as a working conservation museum there is a feeling of gloom and degeneration all around. It is but a short walk from the town centre and yet black-bags of rubbish stand like monoliths on the neglected pavements aligned alongside mounds of fly-tipped domestic refuse. It’s difficult to imagine that the streets hereabouts have been used as locations for a number of films in costume dramas and as backdrops for the novels of Edwardian Potteries’ author, Arnold Bennett. This is certainly a step back in time but sadly back to the worst of times. 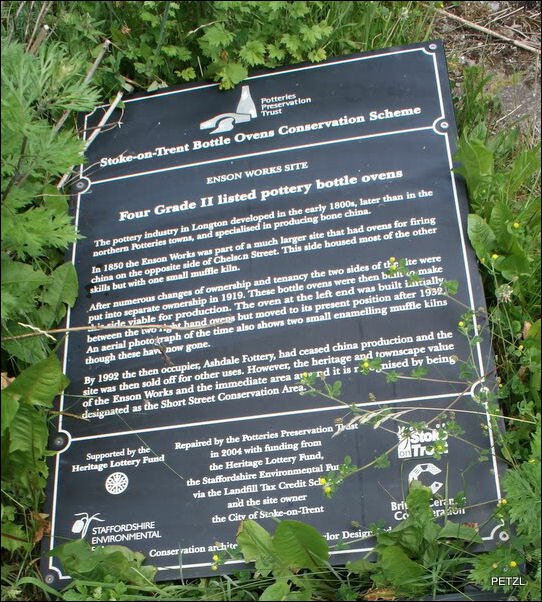 Stoke-on-Trent Bottle Ovens Conservation Scheme? A wall-full of colourful graffiti yells messages from its anonymous artist – ‘Smelly from Dresden’ – yawping rudely from the dullness of the ancient Staffordshire blue-bricks onto which are canvassed the credentials of a right-wing political group – the BNP. I muse that it probably would be in order to append ‘Abandon Hope all ye who enter,’ or as ‘Smelly from Dresden’ may well be screaming with his spray can – ‘hey you, nothing has been done!’ – ‘people are still waiting!’ And where’s all the bloody money gone! As I walk past a number of pot-banks I am again arrested in my tracks but this time by the sensational aromas of vanilla as I grudgingly pass the confectionary factory of Walker’s Nonesuch Toffee. This is one of those occasions where it is in order to undeniably praise the sense of smell as being the best of all the human senses. A blast from the past sweeps over me and I am a boy again with a brass three-penny bit of pocket money to spend on a bar of chewy toffee. 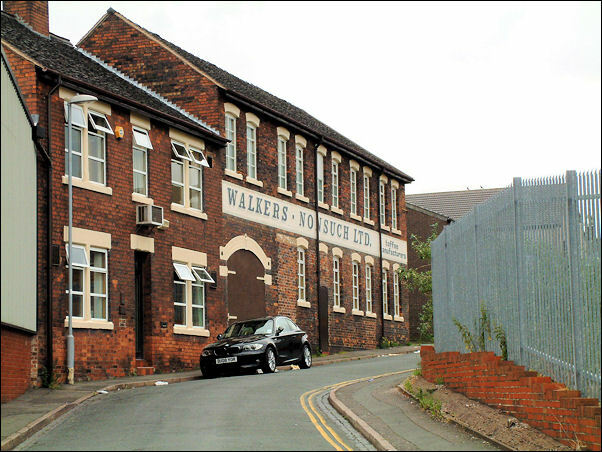 On the other side of the toffee factory is Uttoxeter Road – the great lane which I have followed from Goldenhill and Tunstall, the former A50 before it ceded its sovereignty to the swish new road. The old road looks forlorn with just a few famous potteries remaining; John Tams, Royal Doulton and Shires Bathrooms sit side by side sharing the emptiness with the remnants of old Georgian cottages. The road is quiet and stunted, its importance diminished. The proprietor of Edwardian China is Les Lockett a Potteries’ hero who ran away as a boy to join the army, saw service at Arnhem during the D Day landings and even at the age of 83 still parachutes from airplanes for charity. Les was born a few yards from his factory gates and remembers the old terraced houses the remains of which settle around Short Street within the ‘Gladstone and St James Design quarter.’ Here once was the celebrated though detested John Street, a grotesque slum of back-to-backs photographs of which are displayed at the Potteries Museum. On this site stood the Old Crown pottery owned by a careless businessman who borrowed money off Les’s grandfather to pay out wages. Soon the pot-bank came into the Lockett family. It was a small start but Les later made the business thrive wonderfully. 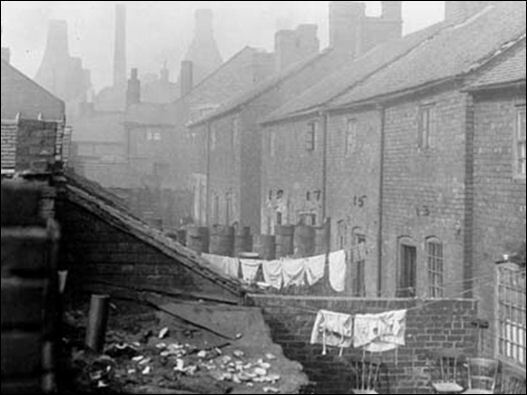 Pot-banks, coal yards and terraces – those were once the only buildings in Normacot Road. 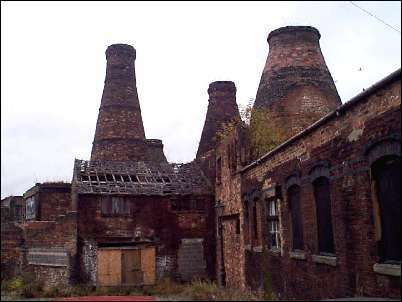 “I can remember looking out and seeing nothing but smoke that billowed 365 days a year,” says Les listing off bewildering numbers of potteries that once stood between Edwardian China and St James Church just 200 yards away. And Les confuses me by the myriad of locations which comprised to make the thick soup that was once Longton – Cocknage, Goms Mill, Edensor, Dresden, Florence, Sandford Hill, Weston Coyney, Adderley Green – a hundred names seemingly each with its own community, each under the civic cloak of this most industrial of the Potteries’ six towns – China Town. 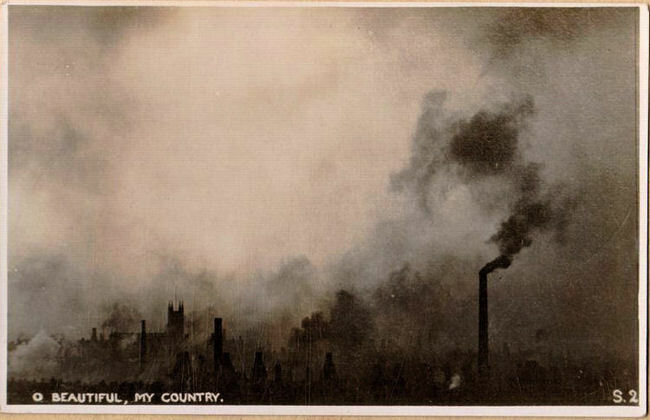 I am reminded of the old picture postcards ‘Daybreak over Longton,’ a scene of desperate smoky blackness – ‘Hell on Earth’ – it may have well been ‘Nightfall over Longton’, and I shudder and wonder how people survived to be as old as 83. But this octogenarian, Les Locket, remembers the town centre as a happy and activity-filled community. A town indeed that once had as many famous shops as Hanley. “Of course times have changed all this. When I was a boy there were 72 pubs on the road from one end of Normacot Road to Longton town centre. And they were needed to break the monotony of life.” Oh to remember the lost pubs of Longton! 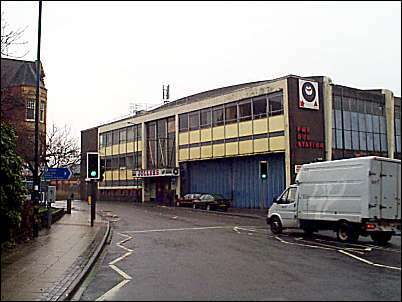 Jollees Night Club and Longton Bus Station (Both now closed). I retrace my steps into town, past the boarded-up Jollees nightclub where once the greatest performers in the world entertained to packed houses. I wend my way through the geometric lanes of that Precinct along the central aisles of the conceptual-box shops all looking out of fashion and each in need of Ken Hackney’s £60’s worth of paint. There are plans to redesign this area and to rebuild it, but the old times are long gone. I return to A Plaice To Eat where many of the pale faces I’d seen here earlier are on their umpteenth mug of tea, a few tapping text into the keypads of mobile phones. What times, I ponder? Lane End - Confusion often arises over the location and names of Lane End and Longton. Originally they were two separate and contiguous townships which were incorporated in the of Borough of Longton in 1865. Normacot - an ancient and important history which dates back to the Domesday book.